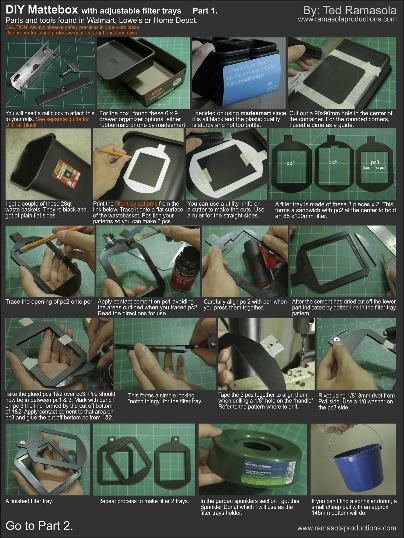 DOP Ted Ramasola has an interesting build tutorial converting a bunch of house hold items into a pro looking matte box. At the ingredients section are a waste basket, drawer organizer, sprinkler donut, splash guard, mousepad, bolts and nuts and aluminum bits and rivets. For those of you who are unfamiliar with what a matte box is. I think it can best be described as the cinematic equivalent to a filter holder combined with a lens hood. Basically it is a box that goes over the lens and provides flagging abilities to avoid flare. 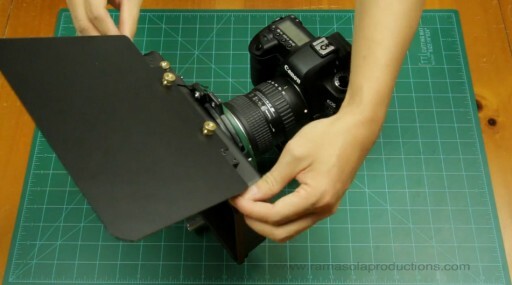 Unlike a lens hood it uses adjustable flaps. The other function of a matte box is to hold filters for in-camera looks or to provide footage consistency. Of course, the next step would be to get compatible filters, and this matte box can accept (or stack) two Cokin-p filters. « Will MōVI Be A Game Changer In The Video Production World? This is what D.I.Y. is all about for me. Something well designed, not too difficult to build and doesn’t cost too much. THX. Those who’d rather not diy, you can find mattboxes on eBay for $15.